The leader of UKIP (the United Kingdom Independence Party, whose main policy is that the UK should secede from the European Union) is Nigel Farage. The Independent on Sunday newspaper this week had an interview with him, in the course of which the interviewer asked how we should pronounce his surname. 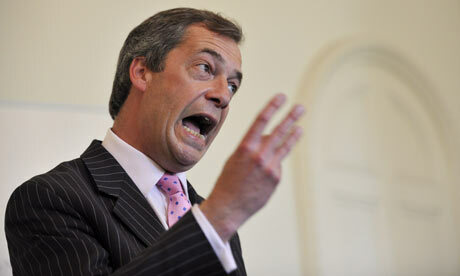 So Mr Farage himself says ˈfærɑːdʒ (or possiblyˈfærɑːʒ), but he doesn’t mind much what anyone else says. It seems to be five years since I last wrote (blog, 23 Jan 2007) about the vagaries of Velar Softening — the principle by which velar k and g change to coronal s and dʒ respectively in Latinate words when the following vowel is spelt i, e, ae, oe, or y. From the point of view of spelling-to-sound rules, Velar Softening is responsible for the fact that before the vowel letters mentioned the letter c is almost always pronounced s in modern English, while the letter g is quite often dʒ (but NB the many Germanic words such as give, get). Historically, before the Great Vowel Shift of six hundred years ago, this made sense. You had palatalization (softening) before palatal vowels. Since the GVS its naturalness has disappeared, which is why we now have various anomalies. For example, we may be uncertain about the consonants in loci (plural of locus) and fungi (plural of fungus). One disturbing factor is the power of morphological analogy (this term is self-referential!). Given that the word analogy is əˈnælədʒi, there is pressure for the related analogous to be əˈnælədʒəs rather than the standard əˈnæləɡəs. Given that meningitis has dʒ, there is pressure for meningococcal to have it too. Yet you don’t generally expect g to be dʒ before o.
I was thinking about the word centrifugal. With the hesitation about its stress pattern, in BrE at least, it might be a good word to include in my next pronunciation preference poll: do we prefer ˌsentrɪˈfjuːɡl̩ or senˈtrɪfjʊɡl̩? Latin fŭga ‘flight, fleeing’ has a short vowel, so we “ought” to give this word antepenultimate stress (as apparently Americans always do). But the contrast with its antonym centripetal exerts a countervailing pressure for penultimate stress. As Newton discovered, the orbits of the planets depend on the balance of centrifugal and centripetal forces. I should imagine that the noun centrifuge is about as well known (or not) as the adjective centrifugal. But there doesn’t seem to be any analogical contamination from one to the other. I have never heard anyone use dʒ in centrifugal, or for that matter g in centrifuge. I don't find "rhymes with barrage" much more helpful than "rhymes with garage" or "it's pronounced as it's spelt", for that matter. He wan't wring for you. Lipman. The interviewer, a youngish, serious-looking bloke with the unexotic name Robert Chalmers, knows his readers and know what they know. His readers have paid a substantial sum for a British newspaper which may have the same tabloid shape and size as the Express and the Mail on Sunday (a format more associated with the late News of the World), but which is aimed at the same market as the broadsheet Observer and Sunday Times. The interview (with background analysis and comment) is long — enormously more so than you'd find in the popular press. • There are three basic ways of pronouncing garage in Britain. Some readers may know of extra American pronunciations, but these would not be considered relevant. IoS readers are unlikely to be consciously aware of variations within the three basic pronunciations — and even less likely to care. • By contact there is only one basic way of pronouncing barrage in Britain. Th IoS and the daily Independent are struggling to maintain their readership in Britain. I doubt whether they have much of an international following. The over-assertive spellchecker strikes again! Anyway, I looked it up in LPD and while I wasn't that astonished to find only one BrE pronunciation for barrage (I was a bit, though), I newly learned that AmE seems to make a difference between the meanings of 'dam' and 'artillery fire'. There's a north-south divide in the pronunciation of "garage"? I am oblivious to this. I say garɪdʒ. However, I say [faraːdʒ] for "Farage" so not everyone has the two as rhymes. Does anyone know the origins of the name? The pronunciation of analogous as əˈnælədʒəs is "disturbing", you say? Sounds like you're harbouring some secret prescriptive peeves, Prof Wells! I said that morphological analogy was a disturbing factor, in the sense that it has disturbed the smooth functioning of the velar softening rule (rule in the phonological sense, not any prescriptive sense). I didn't say I founnd the pronunciation əˈnælədʒəs disturbing. Aah. My apologies - I must have been projecting my own peeves there! I for one never came across any reference to such an object until well advanced in adulthood. Centrifuges are found in very specialist laboratories and mechanisms. But the concept centrifugal force is used in popular explanations of stuff that children often hear long before it comes up in school physics lessons. Your father obviously didn't keep bees! We had a centrifuge at home to extract honey from honeycombs. As a matter of fact, I personally know the device primarily if not exclusively from apicultural contexts, and as I was reading your lines quoted by David I could not help wondering whether you expected many to have had much contact with bee-keeperdom. As a side-note, in Dutch a "centrifuge" is the common word for the nowadays not so common home appliance I think is called "spin dryer" in English. [T]he contrast with its antonym centripetal exerts a countervailing pressure for penultimate stress. Unless, like me, you say sɛnˈtrɪpɪtl̩. Me too, Steve. I don't remember hearing anything else — though this could just be my ears simultaneously translating and deleting any memory of the input. Mind you, I do remember hearing ˌsentrɪˈfjuːɡl̩. I use it myself some of the time — perhaps more often than senˈtrɪfjʊɡl̩ . Loci is surely a rarity in English. The only use familiar to me — although not generally familiar — is the system of imagined stopping points on a journey into which you place imagined objects in order to memorise a sequence. Because of the antiquity and antique associations. I'm inclined to call them ˈləʊsai. I know 'loci' in the sense of a place in a book, like the 'locus classicus' for something or other to be in Leibniz' 'Theodicy' or some such. Alongside that, there are other 'loci', less or not at all 'classici', yet sometimes deserving attention for a reason. This from books written in English or something like English by to a large extent NNS, thus the use may be totally un-English, even though popular in the polyglot community of Scholars. this I have known under a Polish, and then a German name, from more or less the same age onwards, the latter being 'geometrischer Ort'. Obviously, in English an adjective like 'geometric(al)' is not part and parcel of the expression. I also took GCE Additional Maths, but loci were never mentioned — or passed me by. If I'd read the word then, I would have inwardly heard ˈlɔki:. Where latin locus/loci becomes the French 'lieu', the mathematical concepts is called as in German: 'lieu géométrique' or, to make things clearer to students, 'lieu géométrique des points'. What an waste of ink compared to the 5-letter 'locus', isn't it? An Italian philosopher of law, Amedeo G. Conte, has formulated the concept of a 'deontic locus' (luogo deontico), by analogy to 'luogo geometrico'. Something or other can be defined as a 'deontic locus' of a set of rules if it acts in conformity with these rules. To be more precise, an ideal rule-conformer is a 'luogo deontico' of the rules in question. Thus, the adjective is not, or at least need not be, a waste of ink. Without having heard (or read, for that mattter) 'fungi' and 'loci' much (the latter somewhat more often) I would assume, going by what I know Latin words in English are generally pronounced like, that these words sound 'funj-eye' and 'l-owe-s-eye' in the mouths of the Anglo-Saxon. That they should say 'fung-eye', under the influence of the Italian form 'funghi', perplexes me. That way of pronouncing Latin was challenged in the nineteenth century and a movement to teach a more authentic system in British schools made steady progress until by the end of last century hardly anybody used the old ways of saying Latin words in Latin. This has influenced the way we pronounce the words and phrases that have survived in legal and ecclesiastical texts. I'm not sure how many lawyers today have studied Latin, but in the latter part of the last century a lot of lawyers would have studied the language in school with the 'reformed' pronunciation. Fungi is not like Benedicite or decree nisi — which can be heard in either pronunciation. It's a word that we have to use for ordinary observation of nature, and for ordinary culinary reference to thinks which are not mushrooms in the very narrow sense we use the word here. no doubt. And also in medical contexts. I fail to see, tho', how this would explain the invasion of an Italian-inspired pronunciation. thank you. So you think ˈfʌŋgi is due to the Italian influence? It's hard to say whether ˈfʌŋgi is 'due to Italian influence' or simply the way the speaker learned to pronounce Latin. 'Reformed' pronunciation requires something like ʊ for letter u as a short vowel — we reserve an u character for the long vowel, just as we do (most of us) in English. I think most English people who have learned Latin for any length of time use ʊ and u: — but it's easy to see why so many substitute the opposition typical of RP and many other accents ʌ and u:. There again, for many English speakers it's probably just the 'hard G' (i.e. g) in fungus that motivates a similar g in the plural form. This factor together with a half-remembered echo of the old pronunciation is presumably responsible for that strange pronunciation which I'd forgotten about until Kilian mentioned it: ˈfʌngaɪ. I can't stress often enough that for many, many English-speakers fungi is an unfamiliar word for an unfamiliar concept. Fungus is a very familiar word — but only when denoting a particular type of soft messy fungus. It's a great surprise to most of us when we first lean that mushrooms are fungi. Fungii s a word which we seldom hear. Funghi is a word which many of us hear quite often in English sentences relating to Italian food. When we read the word fungi, few if any would instinctively say ˈfʌndʒaı — and relatively few have learned that pronunciation. That leaves ˈfʌndʒi: as quite a natural response, but a surprising number of us prefer ˈfʌŋgi:. A short practical question: which pronunciation, if any, shall I recommend to my students: mine (ˈfʌndʒaı) or some other? Remember that we are all educated people not trying to pretend we are Britons or anything like it, and quite happy to be recognised for what we are, yet on the other hand we want to sound comprehensible to Britons as well as to great many English-users of our linguistic and stylistic register from all over the world. If your students are biologists, I should warn them of the different pronunciations. When talking to English-speaking biologists, they should simply copy what they hear. 1. Many English speakers may fail to recognise ˈfʌndʒaı. the only snag: it's terribly awkward. I was only familiar with the pronunciation ˈfʌngaı, as perhaps popularized by Sir David Attenborough (I recall John blogging about this a while ago?). @Wojciech: what language/dialect is "swere Spraak"? the pronunciation 'funj-eye' I know as 'the' orthodox pronunciation of 'fungi' I have always made sense of in this way: first, the 'g' becomes a 'j', under the influence of the following front vowel 'i' ('ee'), like in all Latinate words. The, the Great Vowel Shift enters the scene and trasformes the 'ee' into an 'eye'. For anyone puzzled by the last two posts, Wojciech read my first posting and replied before I posted a corrected version and deleted the original. The way the threads now lay themselves out makes this even more puzzling. My 0748 a.m. posting is a corrected version. Wojciech's 0753 a.m. posting is a reply to the original — now deleted — version. Not that puzzling, if Wojciech loaded the page in his browser before 0748 a.m., then replied at 0753 a.m. without refreshing the page. I think of centrifuges as mostly found on dairy farms and in aerospace facilities. For me, garage rhymes with barrage: both have final stress, and neither one has an affricate. I myself have heard all four possibilities for fungi: /ˈfʌndʒaɪ/, /ˈfʌngaɪ/, /ˈfʌndʒi/, /ˈfʌngi/. The first one is the one I use. this encourages (incurrajis) me to hold fast to my pronunciation, which is also /ˈfʌndʒaɪ/. I very vaguely seem to remember (seem to!) centrifuges used also in the butter-churning business, but that was like 50 years ago. Interesting that the velar softening in English is linked to palatalisation. In Russian, velar softening from g to ʒ and from k to ʧ are both common - e.g. from nouns "книга" "рука" you get adjectives "книжный", "ручный" - but where these occur, it is distinct from palatalisation (as in "в книге", "в руке"). Well, it's really velar softening in Latin, that shows up in words borrowed from Latin and affects English language spelling. The palatalisation of /g/ happened first in the prehistory of English. The core of those words where we speak of 'hard and soft g' came to us from Latin via French. First in Latin the /g/ phoneme developed a palatalised allophone before front vowel. Then the allophone became a phoneme, which in Old French developed into affricate dʒ. We've kept the sound, while Modern French has simplified it to fricative ʒ.
I read that for our one palatalisation of velars (in Latin) in prehistory, Russian had three (in Proto-Slavic). The first palatalisation was similar to ours: a single /g/ phoneme in Proto-Indo-European divided into two allophones, which eventually became two phonemes in Proto-Slavic. Hence the pairs of stems книг ~книж and рук~руч. Still in Proto-Slavic, the adjective-forming suffix -ьн- attached to the stem with the palatalized final consonant. Hence книжный, ручный. Where Proto-Slavic differs from Latin is in the development of palatalised allophones of consonants other than velars — allophones which developed into phonemically distinct 'soft consonants'. also allowed to stand before both front and back vowels. It's questionable whether the non-palatalised and palatalized allophones can be said to have become phonemes in Russian. Some of the reference books recognize 'hard and soft' к on the grounds of rare forms like ткёт a number of foreign words with palatalized к before а, о or у. Palatalised г is, I think, generally treated as an allophone. I may have misunderstood, but I understand that the first Proto-Slavic palatalization was forced on the velar by a following palatal —the consonant changed but the vowel didn't — while the 'syllable harmony' process that created hard and soft consonants allowed for different forms of interaction — either the consonant or the vowel could change.